America's obesity epidemic has brought with it new health problems. There has been a spike in the number of people with high blood pressure and a big increase in cases of type-2 diabetes, a disease directly related to obesity. Researchers at Florida Atlantic University have published a study describing how being overweight or obese can contribute to metabolic syndrome, which is a group of adverse health conditions – high blood pressure, high blood sugar, excess belly fat around the waist, high triglycerides, and abnormal cholesterol levels. Doctors say a third of adults in the U.S. are affected by it – 40% of those 40 and older. Traditionally, doctors have evaluated the various risk factors separately. But the Florida Atlantic researchers believe the individual risk factor are greater than the sum of their parts. When it comes to metabolic syndrome, you can tell a lot with just a quick glance. Doctors want to see a man's waist measure no more than 40 inches, and a woman's no more than 35 inches. The visceral fat component of abdominal obesity can lead to the body's insulin resistance. It can also trigger the release of fatty acids from body fat. Lipids can accumulate elsewhere in the body, like the liver and muscle. One dangerous problem with metabolic syndrome is that someone with the condition might not show any symptoms but run a high risk of suffering a cardiac event within a 10-year period. They run nearly the same risk as someone who has already had heart failure. More concerning to health researchers is the fact that metabolic syndrome risks are rising, not declining. 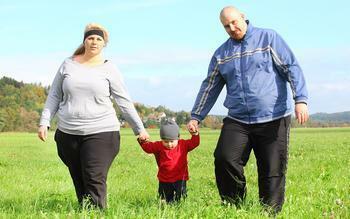 They are rising because Americans, starting in childhood, are increasingly overweight or obese. The Mayo Clinic advises consumers to seek a doctor's advice and treatment if you have a large waist. Another sign that you are suffering from the condition is very high blood sugar and symptoms associated with diabetes, such as increased thirst, fatigue, and blurred vision. Treatment for metabolic syndrome usually includes drastic changes in lifestyle, with an emphasis on exercise and diet.